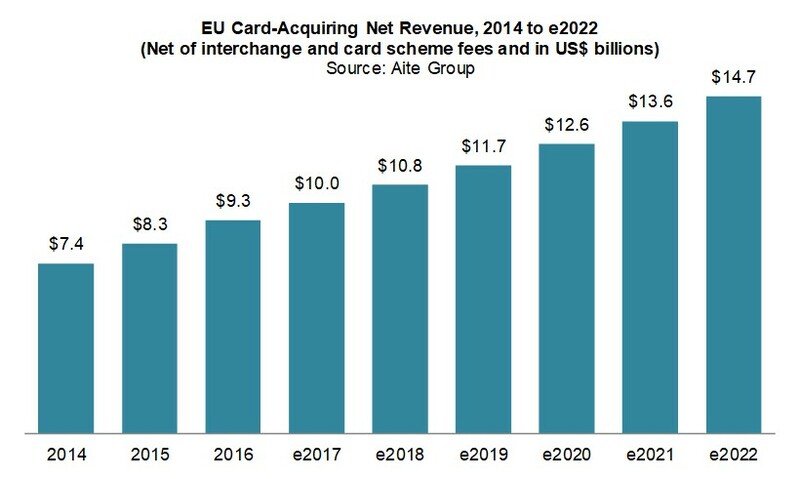 Aite Group estimates that by 2022, the EU card-acquiring market will be worth US$14.7 billion in net revenue. London, 4 September 2018 – From a consumer perspective, the single euro payments area for cards has practically been realized: Consumers can use their cards throughout the European Union with the same ease and convenience as they do in their home country. On the acceptance side, however, the situation is different. Large retailers with physical operations in multiple countries are increasingly looking for Pan-European acceptance solutions, but acquirers that offer cross-border payment services run into local specifics and market inefficiencies that make it difficult to compete with local providers. This report analyzes the acquiring market in Europe and identifies opportunities and challenges for cross-border acquiring in the region. It is based on 25 interviews held in the second quarter of 2018 with payment executives from large merchants, acquirers, card schemes, and consultancy firms active in Europe. This 32-page Impact Report contains eight figures and six tables. Clients of Aite Group’s Retail Banking & Payments service can download this report, the corresponding charts, and the Executive Impact Deck. This report mentions ACI, Advent, Adyen, AfterPay, Bain Capital, Bank Pekao, Bancontact, Barclaycard, Blackstone, BNL Positivity, BNP Paribas, BS Payone, Carte Bancaire, Concardis, Crédit Mutuel, Crédit Agricole, CVC Capital Partners, Dankort, Deutsche Bank, Elavon, Ethoca, Euro 6000, EVO, Feedzai, First Data, Girocard, Global Payments, Groupe BPCE, Gruppo bancario Iccrea, HPS, Hellman & Friedman, IATA, ING Bank, Ingenico, iZettle, Klarna, Lloyds Bank Cardnet, Mastercard, Multibanco, NETS Group, Nexi, PagoBancomat, PayPal, Paysafe Group, Payvision, Raiffeisen Bank International, SafeCharge, ServiRed, SIA, Simility, Sistema 4B, Six Group, Six Payment Services, Square, Stripe, ThreatMetrix, Verifi, Visa, Worldline Group, and Worldpay.